The baritone, Anastas Anastasov, was born 2 May 1927 in Gorna Oriakovitsa. He graduated from the State Academy of Music in 1955 as a student of Petar Raichev, then continued vocal studies with Christo Brambarov. In 1955 he became a soloist with the Ruse Opera and performed there until his retirement in 1990. In addition to guest appearances in the opera houses of Bulgaria, international engagements took the baritone to the German Democratic Republic, Hungary, Russia and other Eastern Bloc countries. 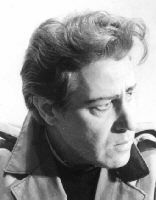 Major roles in his career included Di Luna, Macbeth, Amonasro, Posa in Don Carlo, Renato, Iago and Scarpia.